Fall is here! The first days of school have come and gone. Now the once excited kids bend over or strain shoulders to hold the overly heavy backpacks that contain their school books and folders. 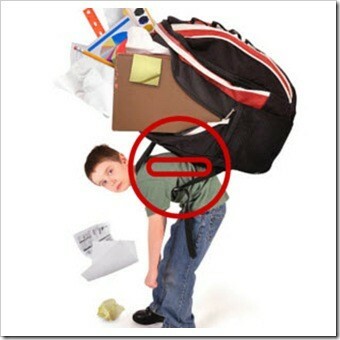 Unfortunately these over filled backpacks are heading our future generations into early back pain,� neck pain, headaches and disease processes. According to figures from the U.S. Consumer Product Safety Commission, more than 7,000 children attend the ER each year due to backpack-related injuries. Unfortunately, this is a trend that will continue as more schools remove lockers from their premises, and thus children are forced to carry around with them extra books and bags for the entire day. This entry was posted on Tuesday, September 8th, 2015 at 1:35 pm and is filed under Health Articles. You can follow any responses to this entry through the RSS 2.0 feed. You can skip to the end and leave a response. Pinging is currently not allowed.